If you ever feel like moving to Lithuania, please do, bring your partner, bring your friends. In stark contrast to the words and actions of an increasingly worrying amount of leaders and nations around the world, there’s always something different about smaller countries. Our (current) globalized economy has meant that workers shift around the globe, looking for the roles and opportunities that suit them. Large nations with large economies have never had to try particularly hard to attract foreign workers, sporadically resulting in counter reactions to the people that a country claimed to need in the past. Despite physical and bureaucratic barriers, they keep coming, looking for new opportunities in lands of wonder. Small states have the reverse problem, they are often desperate for new talent, reducing barriers to entice them, but still struggling to attract or retain the people their economies need. These opening words were the words of Paulius Vertelka, the Executive Director of Infobalt, a body tasking with looking after the needs of Lithuania’s burgeoning tech scene. In the past, he helped reduce the paperwork freelancers needed to fill in when applying for visas, again, an opposite step to other nations. Sharply dressed in a colorful suit, Paulius is dedicated to helping local tech business get what they need, which more often than not, is talent. Our first stop on the trip was to where the education and ideas of many Lithuanian entrepreneurs and engineers begin, at Kaunas University of Technology (KTU). An hour ride from Vilnius, our clean train hurtled through the countryside, the carriage shared by loudly chattering school children exchanging snacks and fiddling with ever-present mobile phones. KTU is a sprawling old Soviet-era building (which sparked another common ex-soviet state-trait, apologizing for ugly architecture), where we met Jonas Čeponis, the Vice Dean of Faculty of Informatics, and other staff. As Jonas gave us an overview of the program, students were defending their bachelors, live on YouTube for classmates (and the world) to watch and comment on, giving them a taste of the modern world of presenting ideas and accepting feedback. After the introduction, we tried two student virtual reality (VR) projects (Lithuania seems to love VR) that to us anyway, seemed comparable to anything I had seen from professional studios. From the University we drove a short way to the combined offices of TeleSoftas, our hosts and sponsors for this trip to meet their staff, projects, and eponymous founder, Algirdas Stonys. As a broad serving agency, innovation house, and series of sub-studios, it’s hard to summarize the kinds of work TeleSoftas engages in precisely, but they have long-term grounding in telecommunications, games, and interactive product design. Algirdas Stonys and the staff board that employees are encouraged to memorize. It’s easier to define how they operate. I was recently exposed to the term “Psychological freedom”, i.e., the feeling that you are safe to experiment and try ideas without immediate blame or fault. TeleSoftas is a fantastic example and case study of this practice. Time and again people we spoke with told us how a project was born out of a passion for an idea they had, with no immediate term need for it to be profitable or to even work. From top to bottom, there was a consistent expression of satisfaction with the company, it’s structure and leaders. Algirdas, ever cheerful and laughing, is increasingly infamous for his business and management outlook, with campaigns such as “Step forward” encouraging businesses to be more than profit machines, and his TEDx talk on fostering communities. Like others we met in Lithuania, the company is working to bring the World to Lithuania and vice versa, running international game conferences (GameOn, with 16,000 attendees in 2017), a (growing) handful of foreign workers, and a small selection of overseas offices that staff can move between if they wish. The remainder of the trip was dedicated to the wonderfully eccentric Login festival (The sub-heading above is their slogan) and interviewing local founders. You can read my full review of the festival here, and here were my highlights of the founders we spoke to or were mentioned to us. Popular with anglers in the USA, Deeper created a small sonar device that attaches to rods and connects to a mobile application to give insights into what lurks beneath the watery depths. I know little about fishing, but had an insightful interview with their CINO Donatas Malinauskas which will appear on my podcast soon. Utilizing the 100s of mobile devices present at any modern public event Interactio, from what I understand, have a custom app that creates audio streams of an event from these devices. It’s a fascinating idea, even if their website is somewhat unclear. Officially located in the UK, but still, Lithuanian, TransferGo join a fleet of North-Eastern European FinTechs in providing fast and affordable international transfers. Bankera aims to create a “bank for the blockchain era,” details are sketchy, but it’s the kind of idea that gets me excited. I repeatedly heard about the favorable financial sector regulations in Lithuania, making the country an ideal base for FinTech companies post Brexit. Founding a FinTech is one of the most straightforward processes in the EU (which gives you access to the whole EU), and if you bring an idea that doesn’t match any current paradigms, then the regulator creates a sandbox for your company to experiment and be observed. An intriguing combination of crypto-economics and online courses, BitDegree incentivizes students on courses by rewarding them with tokens as they progress through a course. Computing related courses typically have a high student drop-off rate, and this inbuilt reward system is an interesting, if depressing (that it’s needed) way of keeping students to stay on courses. I met Monika Katkute of bit&byte at Login festival who’s passion for helping children to learn coding skills was infective, and with dozens of classes teaching 100s of students in two countries, I hope her enthusiasm passes to the next generation. Time and again interviewees told me that “Lithuania is good at lasers,” which is curiously true, and alongside Deeper, it’s surprising how many Lithuanian hardware companies manufacture locally. Integrated Optics join the plethora of companies I’ve met creating components for modern communications infrastructure, and NanoAvionics? Well, they have a “multi-purpose satellite platform,” which sounds simultaneously mysterious and fascinating. 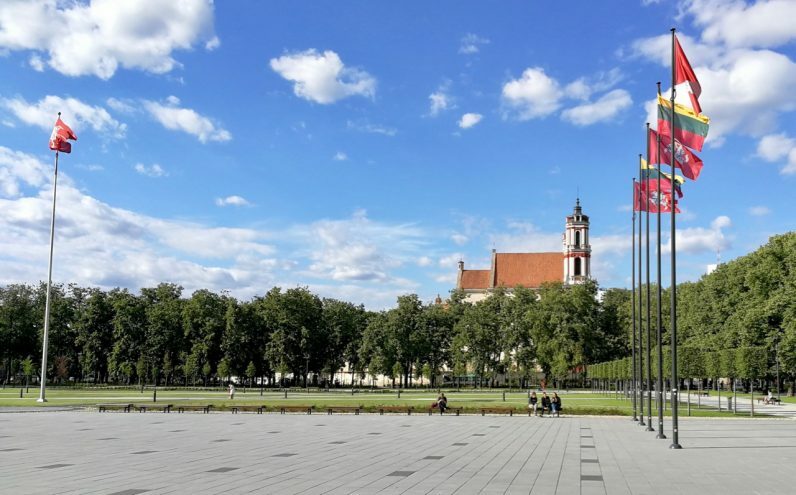 I have now visited and written about all three of the Baltic states, and a handful of other smaller nations on the periphery of Europe, all working diligently to have the world notice them. Lithuania shares characteristics that are common among other smaller countries. These include a global outlook from day 0, modern infrastructure (try finding reliable 30MB public WiFi connections in Germany or the UK), and a willingness to try new ideas to see what happens. As older and larger nations in-fight, I have long pondered the re-rise of smaller, more nimble nations, and even city-states. Many of the people I interviewed on this trip were overwhelmingly positive about their nation’s prospects, which is a trait in itself, but I am not naive enough to think there aren’t problems. Besides the shortage of individual talent (and stopping locals leaving) common in smaller nations, I did also observe a divide between specific groups of the population that is also a common trait with ex-soviet states. Specific groups look forward to what they can do next, while others are stuck in the past, to a time that they perceived to be better, and this divide will grow if countries don’t address it. But overall, I found the country friendly, hardworking and positive. Yet another example of a nation that we shouldn’t dismiss and should instead pay much more attention to. They will be waiting to welcome us. Disclaimer: The trip to Lithuania was sponsored by Telesoftas.